Kanana Camp is on the Xudum River in the south-west region of Botswana’s Okavango Delta and offers travelers a fantastic wildlife experience. This part of Southern Africa has many small islands with figs, palms, figs, knob thorn and ebony and is home to a great diversity of plants, birds and animals in this unique habitat. The yearly floods change some areas of the Kanana concession into a great water paradise. Guests enjoy the best of both worlds: exploring wildlife through waterways and bushveld. Sometimes, one can observe the water visibly rising around the camp’s raised wooden decks. Safari travellers are comfortably accommodated in the camp’s seven spacious double and twin bedded luxury tents. One family tent is also available for parents wishing to share their accommodation with the kids. Each of the safari tents offers an en-suite bathroom which is complete with hot and cold running water, shower, as well as a flush toilet. A Kanana Camp tent affords privacy while being located within a convenient distance from the main camp area. The swimming pool offers a relaxing place for guests to enjoy during their stay. A dining room with the bar as well as the sitting area at the camp and welcoming. The favorite campfire overlooks the Xudum River of the delta. Travelers to Kanana Camp experience fantastic game sightings during the guided game drives as well as the thrilling experience of exploring the scenic waterways by boat of the Okavango Delta. 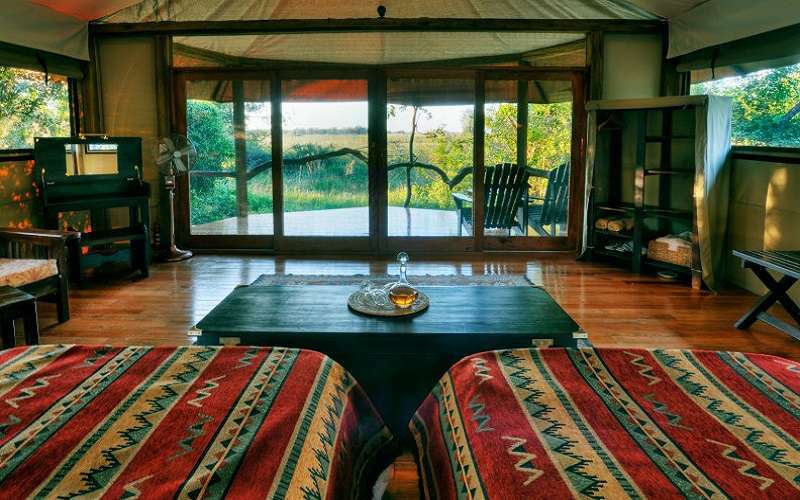 Furthermore, Kanana Camp offers Sleep Out Deck where guests may spend the night under the vast African night sky.